With news stories of inappropriate conflicts of interest amongst retired generals and with more than 3,500 senior military officers and Ministry of Defence officials have taken up jobs in arms companies over the past 16 years, serious questions are being asked about the integrity of British defence procurement and export practices. 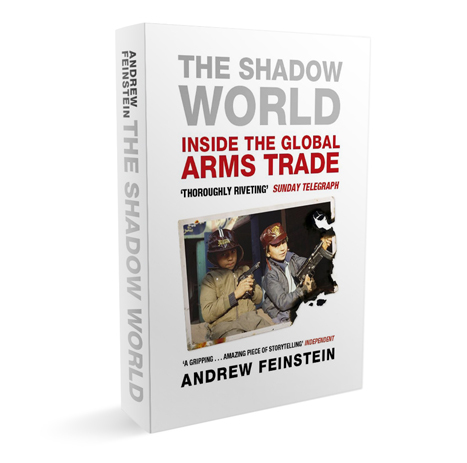 The updated edition of ‘The Shadow World’ provides the most current information on the activities of companies such as BAE Systems and arms dealers like Viktor Bout and Joe der Hovsepian. It covers the latest UK-Saudi arms-related corruption scandal, reveals the London-based entity created by German arms companies to to insulate themselves from prosecution in Germany and to facilitate the payment of bribes around the world, and the extraordinary story of how two notorious arms dealers were used as intermediaries on a debt deal to route money from the coffers of one of the countries to their most senior politicians. A devastating and scrupulously documented account of the greed, venality, and rampant corruption pervading the global arms trade. Andrew Feinstein has produced a brilliant and massively important book. Remarkable and courageous. There is enough in Feinstein's book for a dozen film pitches. Bizarre characters leap from the page... We knew the arms business was corrupt, but only a book as exhaustively researched as this one is able to reveal just how serious and extensive this corruption really is, and how democracy itself is threatened...The Shadow World is a heroic book by an author who, in writing it has put himself in the firing line..."
Feinstein...writes with a crusading spirit and a depth of detail that lend 'The Shadow World' urgency and authority. Many of the sensational stories he tells have earned attention before, but he adds depth and shows how often patterns repeat. A highly pertinent, deeply damning indictment of the flourishing of the world’s second-oldest profession… Feinstein’s book is sound, timely and invaluable. Diligent readers will be rewarded. Feinstein challenges the reader at the outset... It is a measure of his incisive reporting, admirable research across several continents and sustained sense of outrage that by the end of this gripping volume many readers will agree with his central argument that a stiff dose of sunlight is the best disinfectant for this shadowy world. One thing that has been missing has been a comprehensive book for the more general reader, along the lines of Anthony Sampson's The Arms Bazaar, back in the late 1970s. Andrew Feinstein's The Shadow World does just this, and in some ways it is even better than Sampson's influential volume. What is particularly useful is the very unusual combination of a thoroughly readable book that also provides a quite extraordinary range of sources - some 2,500 footnotes in all. ... The end result is a kind of hybrid: something close to a work of reference combined with a gripping and sometimes amazing piece of story-telling. The Shadow World peels back the veil of secrecy behind which the global arms trade undermines accountable democracy, socio-economic development, and human rights, causing suffering across the world. In the same way that Andrew Feinstein exposed a corrupt arms deal that darkened South Africa's rainbow nation, he has now turned his forensic gaze on the impact of similar weapons deals around the world. This book is essential reading for anyone who cares about justice, transparency, and accountability in both the public and private spheres, and for anyone who believes that it is more important to invest in saving lives than in the machinery of death.